Waardenburg syndrome is a genetic condition which affects the color of a person’s eyes, skin, and hair. It is most often inherited as an autosomal dominant trait. This actually means that only 1 parent has to pass on the faulty gene for a child to have WS. 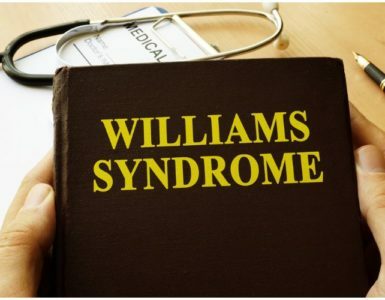 The syndrome is named after Petrus Johannes Waardenburg, a Dutch ophthalmologist, who first described a patient with dystopia canthorum, hearing loss, and retinal pigmentary differences. WS causes 1 to 3% of cases of congenital deafness and affects approximately 1 in 42,000 people. type 4 – it is the association of WS with congenital aganglionic megacolon which affects 1 neonates per 5000 births. Note – types 1 and 2 are the most common forms of WS, while types 3 and 4 are rare. the appearance of wide-set eyes due to a prominent, broad nasal root (linked with Type I). In most cases, WS type I and type II are inherited as autosomal dominant traits with variable expressivity and penetrance. WS type I and type III are caused by mutations in the PAX3 gene. Mutations in the EDN3, SOX10, or EDNRB gene can cause WS type IV. There is no cure for the syndrome, but it can be managed. The hearing should be checked closely. In addition, special medicines and diets to keep the bowel moving are prescribed to patients who have constipation. She is an American dancer and actress who is best known for her role in the television show Gotham, where she plays a young Catwoman (Selina Kyle). She also earned a Saturn Award nomination for best performance by a young actor in her impressive role in the Gotham. Camren Bicondova has Waardenburg’s Syndrome. Due to this syndrome, she has some unique facial features. Stef Sanjati is a transgender woman who lives with WS. His birth name is Stefan, and, according to ”GoFundMe,” his current legal name is Stephanie Luciana Peloza. In December 2016, he underwent facial feminization surgery. However, Stef Sanjati did not allow her surgeon to alter any of her WS facial characteristics. Interestingly, Stef vlogged the whole healing process on his YouTube channel. Currently, his YouTube channel has more than 590,000 subscribers, who are collectively known as the Bread Squad due to Stef’s love of bread. Sanjati also responded with a video called ”My face: Waardenburg syndrome,” that went viral and has over 8.9 million views. She is an American actress who appeared in a few television commercials and series, before acquiring her first important role at age 14, playing series That ’70s Show as Jackie Burkhart. In 2012, Kunis co-starred with Mark Wahlberg in a comedy called ”Ted,” that was directed by Seth MacFarlane. Kunis is presently married to actor Ashton Kutcher. Some sources claimed that she also has Waardenburg syndrome. Shen is the second child and only daughter of pop superstar Michael Jackson. She was born on April 3, 1998, in Beverly Hills, California and was named after the French city in which she was conceived. In 1999, Debbie Rowe, her mother, signed custody of the children over to Michael after their divorce. In 2009, Jackson attended the function Michael Jackson Memorial, a tribute to her father. In May 2012, Paris made People Magazine’s Most Beautiful list. In June 2012, she also made a guest appearance on the Oprah Winfrey Show, where she discussed her experience as a victim of cyberbullying. Paris Jackson’s blue eyes are due to a rare eye condition, however, the specific condition has not been confirmed; there is a chance it is the Waardenburg syndrome.